Peatlands – A Future in Ireland? The Irish Peatland Conservation Council (IPCC) are delighted to announce that a new research project is underway to help develop an understanding of how raised bogs work. This priority raised bog project for 2013 – will involve a detailed analysis of the links between hydrological functioning and surface ecology on Lodge Bog Co. Kildare. This analysis, known as an eco-hydrology study, is considered best practice and has been recommended to be carried out on all raised bogs of conservation concern in the country. 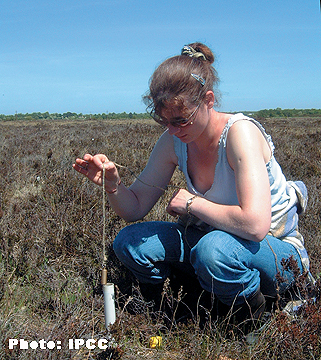 It involves detailed analysis of the current hydrological state of the bog, both at the surface and lower in the groundwater system, which allows for mapping of the historical plant assemblages as well as today’s ecosystem functioning within the bog habitat. “This study will be using the latest techniques in peatland research that will in the coming years be used to assess the conservation value of peatlands right across the country. IPCC are delighted to be at the forefront of this research allowing us to maintain Lodge Bog as one of the best studied bogs in the country” says Tadhg Ó Corcora, Conservation Officer with the IPCC. The project has kindly been supported by Kildare County Council under the Community Heritage Grants Scheme and will be carried out over the next 3 to 4 months. “Only through analyzing what is going on below the ground can we get an insight into what the surface we see everyday has done historically and what it is likely to do into the future” Mr. Ó Corcora continued. This entry was posted in News and tagged Bogs, Conservation, IPCC, peatland restoration. Bookmark the permalink.